Updated 2016: Cross table descriptions added. 2018: added bespoke scoring, multi-game cells, ‘player x player’ format of cross-table. Most clubs hold one or more internal tournaments per season. Why not have your cross tables and/or ladder tables generated for you in your club page? This is easy to do where game results are already being entered into this site during the season. All club key-holders are able to define the table(s) your club requires and enter the game results on-line from their admin page (examples shown below). The tables will then appear in the competition section of your club page and players will see these tables automatically updated as soon as each set of game results are entered. Suitable for multi-round Swiss or round-robin competitions. You can define/change a cross-table at any time, though initialising this before the start of the event allows players to follow progress and be reminded of rules from the start. 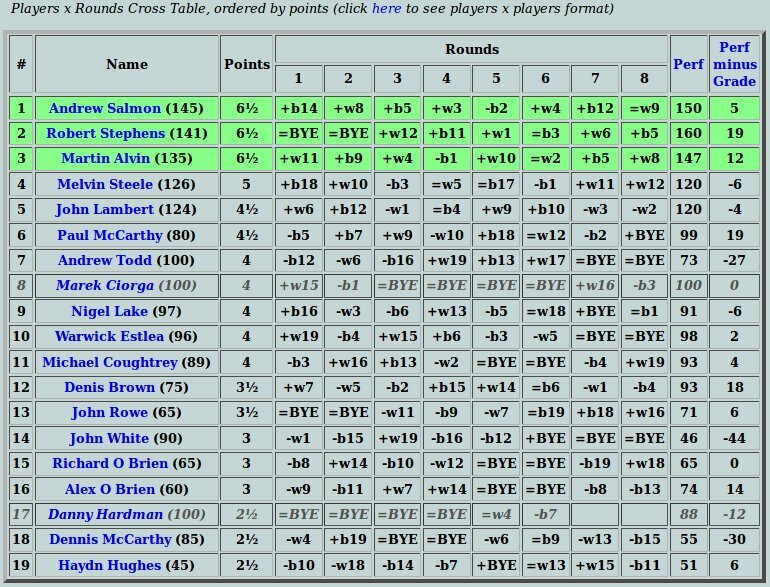 As results for each round are added, tables are re-sorted to show players ordered by points gained or by performance. The game points to be summed up in the table can be tailored to suit your purpose, perhaps to minimise the likelihood of ties. You can choose from Standard (1-½-0), Bilbao (3-1-0) or entirely bespoke by supplying your own values for win/draw/loss as Black/White. (example admin screen shown below). You can edit this table later if end-results require tie-break winner(s) to be marked, according to criteria. 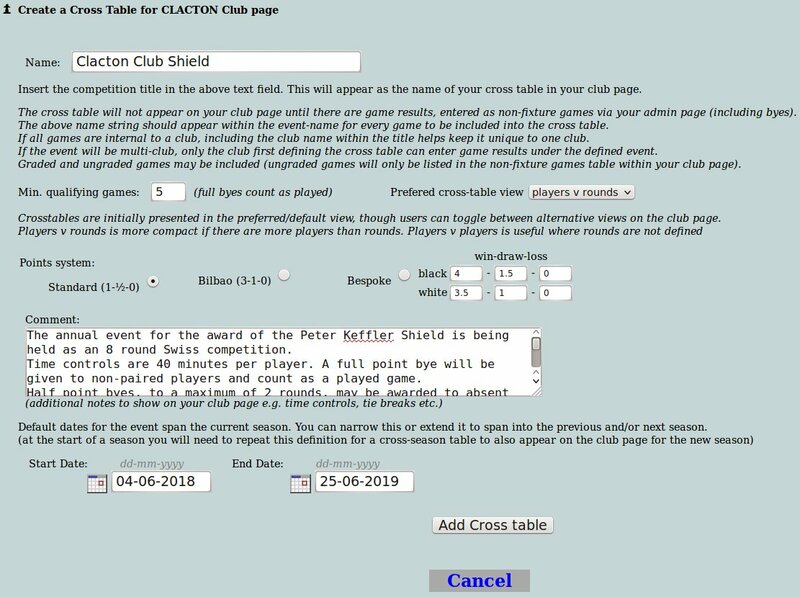 A table will be displayed in your club page when there are results to be included – these will be internal game results where the ‘cross table name’ (identifier string) is contained within the ‘game event name’. Enter any bye result with the player as white (though no colour will be allocated) and opponent ‘BYE’ as black and choose the score that gives the player a half or full point. If a minimum number of qualifying games was specified, the table data of players with sufficient games to qualify will appear in bold and leaders will be highlighted with a green background in the selected ordering (non-qualifying data is in italic/greyed). The example screen-shot below is taken from Clacton 2015/16. Cells may have more than one game result (for example where Black and White are played against the same opponent in the same ’round’) and are shown comma-separated within cells (so you don’t have to regard each ‘half round’ as a separate round). If you don’t want to name any rounds as such, the ‘player x rounds’ format will just show each players results under a single unnamed ’round’. The initial format for the table will be according to the preferred view specified in your table definition, though viewers can flip the display between the alternative views by clicking the link above the table. The mid-season ‘player x player’ example screen-shot below was taken from Dunmow 2018/19 results. These are useful to show participation in club games/challenges taking place over a defined period within a season (possibly over the whole season), not necessarily structured into rounds and with few constraints. The 2012/2013 season saw incentives to influence non-match games in clubs away from being ‘mostly casual’ when funding changes meant most players became direct ECF members and entitled to have any number of club games graded at no extra cost. A ‘ladder’ system was suggested at the 2012 Clacton AGM by Martin Alvin, to be based on all qualifying internal games throughout the season. A trophy was later organised to provide something extra to play for. The ladder was adapted from one of Martin’s previous clubs, who in turn adapted it from elsewhere so we do not know who should take original credit for this. Everyone starts on the same initial (e.g. 50) points and then acquire/loose points based on a scoring system which (as with ELO/ECF grades) adjusts the points for wins and losses based on the current points difference between players. You need to play a minimum number of games (e.g. 8, standard/rapid/any) to qualify for a placing but there is no limit on how few or how many games each person plays. This makes it very easy to run with typical ad hoc club attendances and no pairing requirements to organise! Initially done on a spreadsheet, tracking the scoring of players as game results were reported was susceptible to errors and the ripple effect on later games. Although Andrew and John kept separate copies and compared notes from time to time, adding in a previously omitted game still involved significant rework/re-sorting. Also, results were not very visible unless the spreadsheet was uploaded. As game results were already being entered on-line I suggested/programmed the web-server to do the arithmetic instead and was able to make this a generic facility so all league clubs can run similar ladders if they wish. Providing a trace facility also gave visibility to each stage of the calculation for the benefit of any players wishing to check details. The suggested rules are published here. You can view the Clacton club page for the 2012/13 and 2013/14 seasons to see early examples. 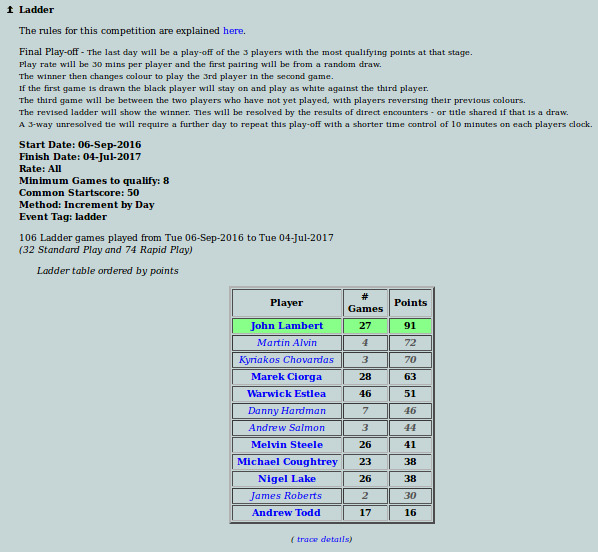 Player names are ‘greyed’ until playing the minimum games for a place and any green row(s) in the table indicate the highest scoring qualifying player(s). 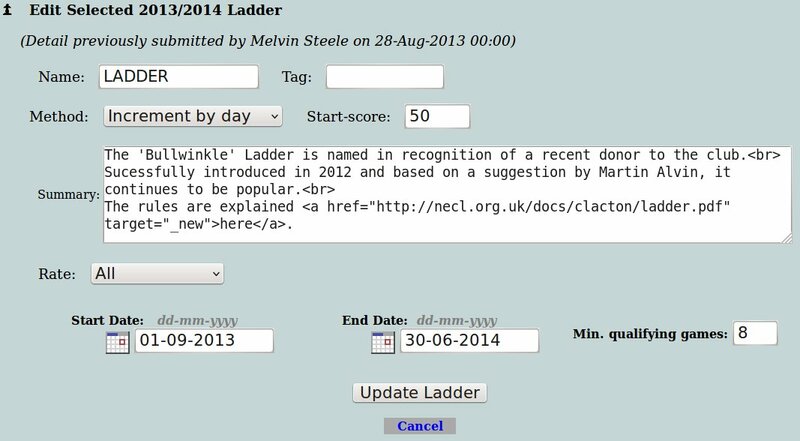 Parameters can be changed at any time, though it is best to set and keep agreed values from the start of each ladder. If ‘tag’ is blank (default) all internal club game results matching the ladder parameters are used to produce the table shown in your club page. Use a tag if you want to be more specific about selected games, where ‘tag text’ has to appear in the ladder name (and hence exclude any other internal events you don’t want counted into a ladder). If unsure about which calculation method to choose, “increment by day” is suggested. “increment by game” – adjusts player scores after each game, so results need to be entered in strict playing order for games within the same day – or different end of day scores may result! “increment by day” – adjusts player scores once for all gains/losses of that day. Each days results can therefore be entered at any time and in any order. e.g. scroll down an alongside comparison between the Clacton trace result for 2012/13 season which used the “increment by game” method, and the would-be trace result if “increment by day” had been used. Note the small end-of-day differences that grow to produce a different overall end-result/winner. Various ‘Plugins’ ( ‘ChessOnline‘, ‘Embed Chessboard‘ and ‘Chess Tempo Viewer‘) are installed to provide chess-graphics for your posts. These can show single game positions, or a whole game animated on one board. The string has to be exactly right to be picked up by the ChessOnline plugin and show the board in your post. If you only see a text string instead of a diagram when you preview your post, double check that you have entered a valid string (and no spaces between bracket and string!). N.B. ChessOnline seems to need the above ‘!’ characters to work. Another quirk, depending on users window magnification, might cause the right-side row numbers to display ‘under’ the table instead of alongside. It has been 7 years since the last available update, so you may prefer to use an alternative viewer for new diagrams (and edit tags for existing diagrams?). 2) The Chess Tempo Viewer can also demonstrate a board position (or complete game) using ctpgn tags as described here and shown below for the same position. To place an animated graphic of a full game into your post you have a choice of tools. 1) You can insert the pgn text string for the game between pgn tags as described here and shown in the example below which uses the ‘Embed Chessboard’ plugin. Your readers can single-step through the moves, or click the ‘+’ button for auto-play. 2) The ChessOnline tool has been extended to also deal with pgn. It was described as experimental, but seemed workable, and is shown in the example below. (though presently lacking a few features such as initialising the display to a specific move and no autoplay). Similar to above but use copgn instead of pgn in your tags. (shown here for the same game). 3) Here is the Chess Tempo Viewer version of same game. A further example shows how this viewer can be used to give a start position/study with follow-on moves and comments.